Dillian Whyte delivered a brutal 11th-round knockout of Dereck Chisora on Saturday and immediately called for a rematch with unified world champion Anthony Joshua. 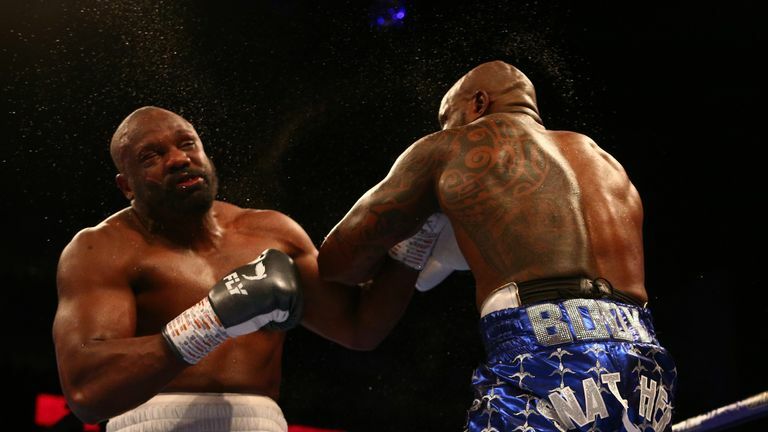 Chisora made much of the running in an intense rematch and was up on two out of three judges' scorecards at the time of the stoppage, despite having two points deducted. But the 34-year-old left himself exposed and was caught with a crushing left to the jaw. Whyte issued a heated challenge to Joshua following his victory, calling for Joshua to join him in the ring. Addressing Joshua, Whyte said: "Rematch, let's go. Let's do this." IBF, WBO and WBA champion Joshua branded Whyte an "idiot" and asked the crowd if they wanted to see a rematch with Whyte, who he stopped in seven rounds in 2015. "If Deontay Wilder ain't serious, and he's going to fight Tyson Fury and he doesn't want to become undisputed, Dillian you'll get a shot," said Joshua.